Growing up and living in New Jersey, the Lindbergh baby kidnapping has always fascinated me. I’ve been to Flemington many times and even have friends who live there now. The as-yet-maybe-unsolved kidnapping and murder case is a huge part of the history in that area and comes up every so often in the media. 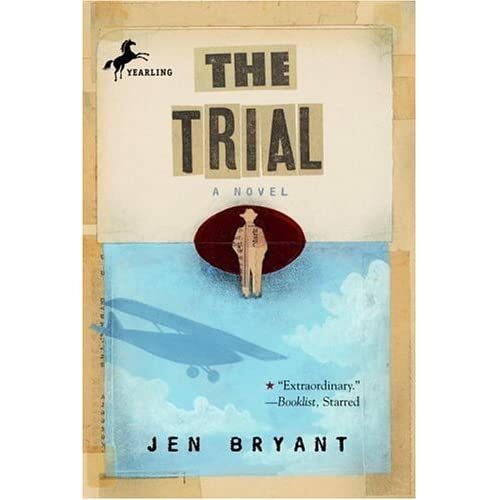 The Trial, by Jen Bryant, is a verse novel that tells the story of Bruno Richard Hauptmann’s trial for the death and kidnapping of Charles Lindbergh. Katie, 12, finds herself in the courtroom day in and day out, acting as a secretary for her reporter uncle. She always thought her town was boring, but now that the trial and inevitable media circus have moved into town, she isn’t so sure if being exciting is worth it. As she watches the trial unfold, including the eventual guilty verdict, she struggles with her feelings on the American justice system and the media. Does she really want to be a reporter when she grows up? Can a man be partly responsible for the death of a child but not deserve the death penalty? Is there a such thing as a fair trial? The novel is full of suspense, as Jen Bryant takes you into the fateful courtroom in Flemington. The Lindbergh trial was one of the most widely publicized criminal cases of the twentieth century and the birth of the American obsession with media and celebrity. The real life characters are the actual players from the trial and Bryant gives an unbiased view of the antics that took place during the case. Also included is a firsthand look at the media circus that was borne from the case- Katie sees Ginger Rogers and various other celebrities in the courtroom everyday. While one man fought for his life and family fought for justice, America watched it like it was a television drama with no real consequences. This is a fascinating book and one I would especially recommend to my NJ students who may not know a lot about the Lindbergh’s.